We are living in a modern busy world. World filled with busy people, busy families, busy work life with busy routine. We have everything we need or we want at our fingertips. Tired after long busy day at office? No worries, there are hundreds of restaurants or take-a-ways right next to the door. Feel like eating watermelon for Christmas? Just fetch one from local grocery store or supermarket who has them shipped from some exotic corner of the world. Did you say you like Chinese food? No worries, just pop into airport, catch the first plane to china to eat it fresh from the kitchen in few hours. Yes, almost everything is doable in this incredible, modern world. Almost everything… With everything looking incredibly simple can we make cooking as simple as possible? I am not talking about fast food here. I am talking about delicious, tasty, healthy home cooked food packed with nutrition. I am a through and through “foodie” by heart. Although I love to cook, spending time in the kitchen isn’t always possible. At a same time I am not very fond of popping a pizza from freezer to oven or dialling nearest take-a-way. Eating out and convenience food may sound good for some time but at the same time they are expensive and packed with fats and calories. Having been a big foodie all my life, I have seen my Amma, Aunts and Atte prepare delicious, nutritious and healthy meals with little cooking time. They never compromised on the quality of the food cooked quickly. 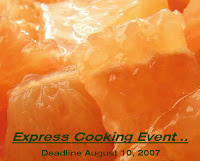 So express cooking doesn’t mean compromising on taste or quality of the food. First dish which came to my mind with the word ‘Express’ was Moong Kichidi, a recipe I learnt from Archana who is a childhood friend of mine. It’s a simple dish which takes very little preparation and cooking time. 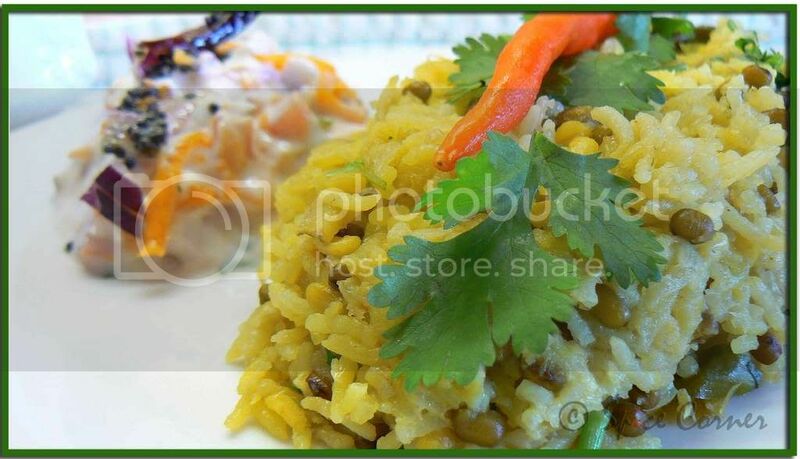 Kichidi, medley of lentils and rice is a one pot dish cooked with different spices. Kichidi is not just a comfort food but also packed with nutrition. Serve hot Kichidi with thanda-thanda, cool-cool Raita and there is very less chance of you not falling in love with this simple and superb dish. If all these coaxing and cajoling did not excite you then what I am going to say next is surely going to sweep you off your feet. So listen to me carefully. Kichidi is one dish which will not just save your cooking time but also your partner’s time in cleaning the dish ;) So here comes my Moong Kichidi with Carrot Raita for this Summer Express Cooking. Wash rice and lentils and soak them in water for 5-10 minutes till required. Chop onions (one for raita and one for kichidi), coriander leaves and ginger finely. Slit green chillies in center. Lightly crush the cardamom and clove in pestle and mortar. Heat oil/ghee in pressure cooker. Add mustard, jeera and curry leaves and sauté. When mustard starts to pop, usually with in 30-40 seconds, add finely chopped onion, ginger and green chilli and sauté it for 1 to 1½ minutes. Now add the crushed spices and sauté it for another minute or so till onions turn translucent. Drain water from rice and dal and add them with sautéed onion and spices. To this add turmeric powder, salt to taste and about 6 to 6 ½ cups of water and mix well(add more water if you like it more mushy and soft). Close the pressure cooker lid and put its weight on and reduce the gas flame to medium. Chop a tomato very finely. Take yogurt in a mixing bowl and beat it with a whisk for around 30 seconds. 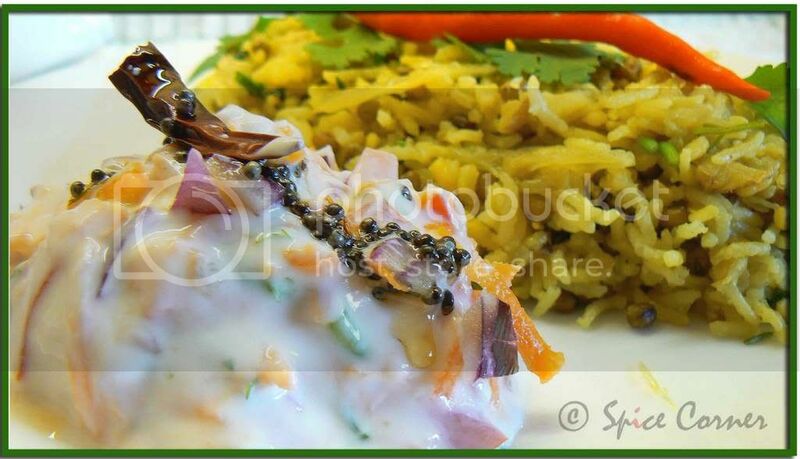 Mix grated carrot, coriander leaves, chopped onions and tomatoes to the yogurt. Heat oil in a tadka pan and add mustard, curry leaves and halved dry red chilli. When mustard starts to pop n splutter transfer the tadka/tempering to raita and mix well. Keep the raita in fridge to chill. Switch off the gas after 10-15 minutes or 3-4 whistles. Don’t rush to open the pressure cooker right away or you will end up with modern art in your kitchen with few nasty burns on your body. Let it cool down for few minutes before releasing the pressure and open the lid. My khichdi has pretty much the same ingredients. I make it more mushy though. The raita looks yum! Love the play of color with the shredded carrot, onions and the tadka. Just checked your dal makhni recipe. Looks yum!! M's bday went well. She developed an ear infection just days before the big day. She has been up pretty much everyu night for the past 8 days. I'm soooo tired! She's better now. Will post her bday pix soon. Hello Sia, just came back after meeting the Surgeon guy,gave me 2 DVDs to watch and asked me to come back in 2 weeks to talk again.So surgery is not going to be this month I guess,I was hoping to get it over with before kids went to school,no such luck.Let's see what happens. Kichdi looks fabulous,nutritios and quick.Thanda Thanda cool cool raita rocks too.Great entry.I will post mine on Monday,it's Eggs! Don't miss the Adai at Aroma,it's yummy. That's moong in the picture? I was confused between corn and chanadal. Khichdi & raita - excellent canditates for express cooking, besides being nutritive. Its been a long time since i stopped here! The khichdi and the raita looks groovy! The ogranne on the raita looks so good. Pictures are delicious! Oh! Those split moon beans look like pearls. And you are so right about take-out foods. As much as I enjoy eating out, I try to watch my nutrition intake and not stuff with empty calories. that is a nice post. you have given the timings stepwise. the kichidi looks very nice. the pics are awesome. great entry. Khichadi and raita look delicious! its so much better to make simple dishes at home than order from outside and feel guilty later. Khichadi and raita is a timeless classic and deifinitely a quick, comforting meal! hot khichdi and chilled raita is just the best kind of food to unwind :). 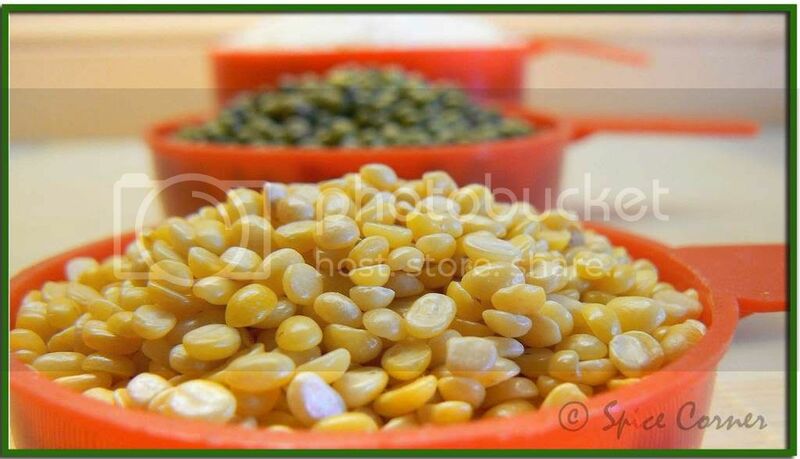 Sia, simply homey Moong Khicidi, nothing fancy but a load of taste no doubt. great entry, sia. it's healthy and comforting. your site is so fast now, i can't believe it. I love carrot raita !! !the picture is beautiful!! You can make everything look so tantalizing - a simple, (normally mushy) khichdi has been transformed into an elegant looking dish and the raitha looks ravishing too! All ready in 30 mins - what more could one ask for. Hi Sia! Kichidi looks awesome and yummy. Excellent combo and great entry. Thanks for sharing. great entry sup... 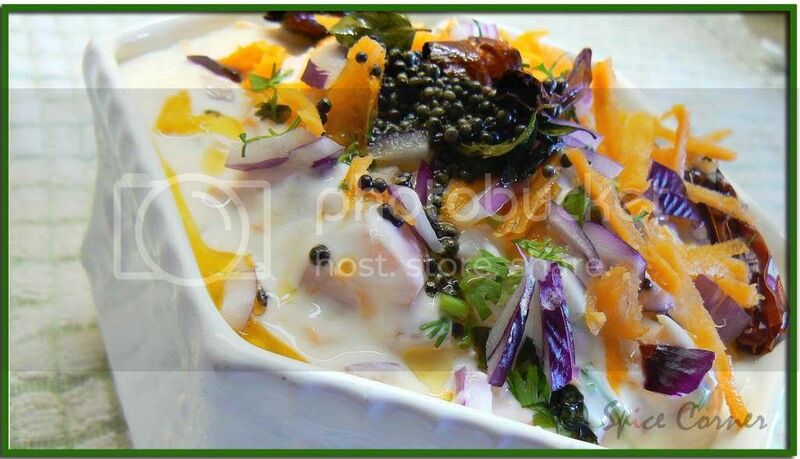 I can't stop looking at the raita pic... looks so exotic.. the colors are beautiful, mustard seeds look like black pearls... just wow! true.. sia its such a busy world, this is a great idea and comfort food! Hey I couldnt see the pictures. Why is that ?? Will check it again sometime today. BTW, I have given link to your blog from mine. Hope it is fine with you. doc knows the best:) so enjoy watching those DVDs(???) now:) hope everything goes smooltly for u.
i agree with u. and i can never get tired of eating kichidi n raita. i knew u will be busy. so thats perfectly alright if u didn't get time to check blogs:) hope u r having good time my dear. ah...after many days i heard 'oggaranne' word:) thank u for ur kind words. thats exactly what i feel. nothing can beat the simplicity of home cooked meals-healthy and tasty. u have said it all about kichidi in just one sentence:) i agree 100%. khana chahoge baar baar... ;)"
thnx so much for the recipe.. i was lukin for khidi recipe.. this will save my time in d kitchen and enage lunch boxge tekkondo hopale akku.. thnx so much..
have been trying to read your blog for a long time, but the page wasn't displaying at all. Do you know I made khichdi everyday for some 2-3 months in Hyderabad after a heatstroke... different dals, but same khichdi... EVERY SINGLE DAY! Loved your recipe. Will try carrot raita soon. That's a fab entry! Kichdi with raita, that's so comforting. Your photography is excellent & your presentation is superb! Is it done in natural light?Any tips for beginners like moi? What a cooling combination.. The rice and raita both look really nice. thanks. Love all raitas.. as long as they do not have any mashed up eggplant in them! Sia - that looks delicious and very summery. Great phjoto. Your poem is cute and how true!! he he he...now i know why u like mushy kichidi;) n yes,i too cansurvive eating kichidi for 3 months;) who wants to spend too much time in kitchen in summer? thank u my dear:) that poem i got it from internet and i felt the same. Yummmm... Kichidi and raita.. perfect , quick and easy!!! Looks Yummy yummy!! I'm always in for one pot meals.Nothing can beat a warm serving of kichidi, Such a comfort food with loads of healthy stuff. bookmarked. i am going to try this next week! Looks yumm!! especially the Carrot Raita. Raita looks gr8, Khichdi looks delicious. Nice entry, nutritious and fast to cook. I just can't go away without saying 'nice pics'! Your raita looks like a bouquet of flowers - that's a compliment! That is one delicious express cooking indeed :)...love kichidi any time. whole moong is definitely beautiful with rice. turmeric added a great color. You know something?? I made this very same dish yesterday, the only variation that I did was to add some veggies and some sauteed spinach. It was awesome. he he he... here is my (actually my mom's;) secret(???) recipe. I dont know for some reason, I can't see the photos on your blog. I guess something wrong on my computer but I like the recipes though. Great entry. ur pics r very nice and looking delicious. Hey pictures are amazing. Mouth-watering Sia. 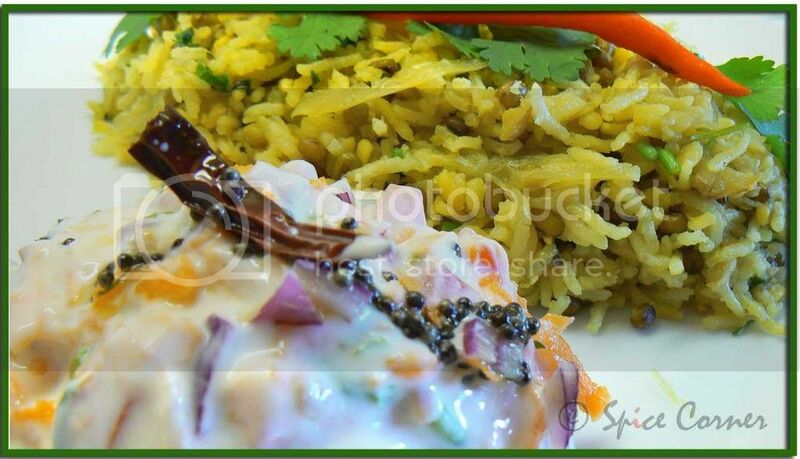 Hi Supriya, khichdi and raita look like a classic meal...they are so mouth watering! Sia, I keep visiting this post to look at that pretty raita and I have a question - how did you make it stand in a lump, or shape? I know you could have unmoulded it, but it wouldn't have stood up, would it? Hi Sia, amazing how you make simple khichadi look so glamorous! BTW, khichudi is quite common in Bengali cooking, but the use of grenn whole moong was something new to me. Ohmigod Sia.. Can I come over for dinner ? The kichedi and the carrot raita looks so so comforting. Just FYI, I have uploaded my latest entry and along with that the MEME for 8 random facts. Thanks again for tagging me. Looks so good! My mom made khichi the other day - the simple green dal with White kadi version. Khichidi is made on those lazy days in my kitchen...that carrot raita is great side dish to go with such kichadi's. Nice entry! 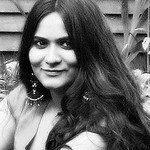 I have never posted a comment on any of the blogs I have visited, but could not stop myself to write a few lines of praise after going through your beautiful blog. The recipes look great and Yumm!! and what can I say about your presentation. Hats off to you. Keep up the great work. I tried the Kichidi, it came petty well, one change i added one potato and 3 carrots finely chopped. added cardamom powder this enhances the taste, instead of oil use Ghee, the taste which comes out is no match.. This was the first dish I tried from your blog. And it was sensational especially after a long day! And I tried only because of the beautiful pictures :) Thank you.